New Zealand have won the Oceania Championship – beating Australia again – while Papua New Guinea qualify for the World Cup. The Ferns have lifted their first title of the season – and continued their post-Olympic run of wins over rivals Australia in Suva, Fiji. A near-full strength Black Ferns were too strong for the Olympic champions – who were still trying out some “discoveries” from the recent Uni Sevens series - in a final played in very wet conditions, so much so that the plate final was called off. The Ferns scored a try in each half through Ruby Tui and Gayle Broughton, while Australia's consolation try to Evania Pelita came after New Zealand lost Alena Saili to the sin bin for a professional foul. It completed an unbeaten tournament for the Ferns, who beat Fiji in the semi-finals having sailed through their pool on the first day, though they did concede a try to the surprise team - Cook Islands – and were held to just 15-0 by Papua New Guinea. That performance from Papua was of real and lasting importance, however, as they had been held 12-12 by Cook Islands in their opening game, and if they had lost by more than 27 points they would have missed out on a place in the semi-finals – and therefore a place in the World Cup. But a backs-to-the wall performance ensured that the Ferns could only cross the line three times. Meanwhile Australia have blitzed through their pool, including a big 28-5 win over Fiji in front of an enthusiastic Fijian crowd. The weather was a major factor on day two, with rain-enforced delays eventually resulting in the cancelation of the 7th and 5th place playoff finals. Fiji lifted the crowd when they beat Papua comfortably in the third-place game, before Ferns win in the final. 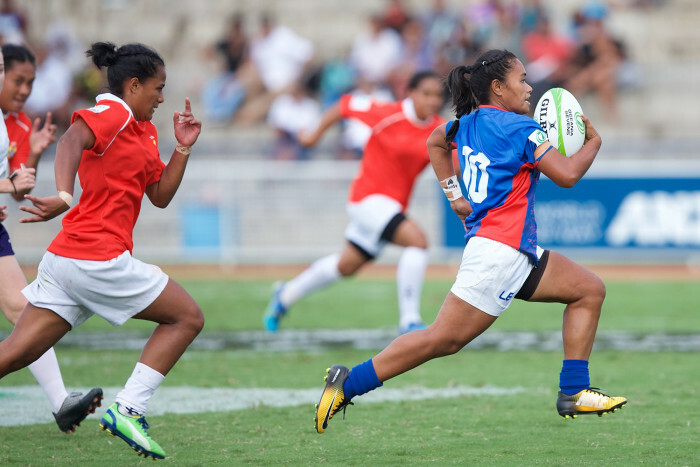 One other highlight was the presence of eight teams in the tournament – the largest Oceania 7s ever in a tournament that has only commanded a regular place in the schedule since 2012. While some teams such as Tahiti and Tonga were well beaten, they will have taken away a lot from the experience. Semi-finals: Samoa 59-0 Tahiti; Cook Islands 29-0 Tonga.